So we met up with Elberon, as he was waiting for Vanessa & Co. to get off Invertigo (which is a step above a Fair ride in design, but is pretty innovative as a whole). They enjoyed it, but it wasn't really for us. The seating was like a metro... some people face one way and others face the other, so you're back-to-back and facing others. The track falls, goes up, turns, does a loop, goes down, then up again. It stops for a second, then does it backwards, meaning you ride facing the way you weren't before. 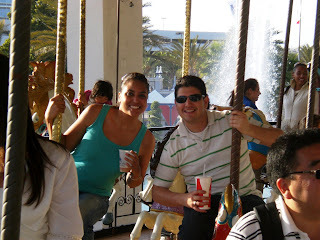 Anyway, they got off the ride, and the group of us headed over to the "New Orleans" section of the park. 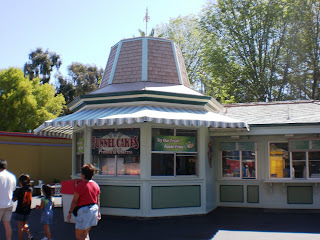 No idea how that fits in with anything else (the other areas are Nickelodeon, Action Zone, All American Corners, County Fair, Kidzville, and Celebration Plaza), but they had funnel cake over there, and three were purchased. JB and I only had a couple bites, mostly because I was curious as to how whipped cream, strawberries, and apples tasted, as my previous experiences are only powdered sugar. Well, they tasted like a fancy french toast dish at IHOP, but the funnel cake itself was the greasiest I'd ever had. 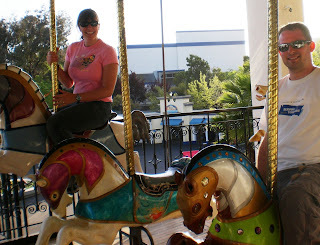 From there, we headed to the Carousel Columbia. 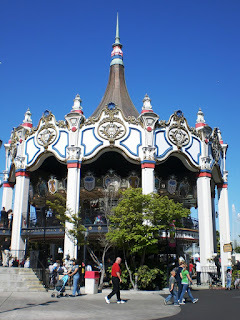 I had been wanting to ride it all day (it's tied with it's twin at the other original Great America for the World's Tallest Carousel), as it was a double-decker, and I've always loved those. We got a few cute pics on it. Then headed over to Star Tower again, since the group hadn't been on it yet, and since there's no wait, it's worth going on. I took a video... it's kinda loud, but an amusing thirty seconds, I think. The ride we missed that I wanted to do? The River Rapids-type ride (think Popeye at IoA), called Rip-Roaring Rapids. It was just too cold by 6:30 to consider getting wet. The Demon is the park's oldest coaster, and was called Turn of the Century when the park opened in 1976. Flight Deck is the roller coaster shown in Getting Even with Dad and Beverly Hills Cop III. It's still North America's longest inverted coaster, and was built in 1993. When Paramount owned the park, it was called Top Gun, then went back to Flight Deck, was changed to Afterburn for a few months in 2008, and is back to Flight Deck. Invertigo was the country's first roller coaster to have face-to-face rider seating, and was California's first boomerang coaster (apparently that's the name for a coaster that runs the track and then returns the same way, LoL). Vortex is Northern California's only stand-up coaster. I didn't mention The Grizzly. It's a large wooden coaster (and I don't do woodens after Gwazi at Busch) that they had a problem with all day. They weren't running it at all, then running empty cars, then they ran a few with people, then emptied the line of customers, then only ran empty cars for the rest of the day. Well, turns out that this coaster (which opened in 1986) has the WORST ratings in the WORLD consecutively since 2005. Flags at half-mast (seen in pic on Part I): it's for the Oakland police officers who had been killed earlier that week.